A very BIG give away! Do you love colour? Would you love to improve the way you use colour in your projects? Do you want to immerse yourself in a workshop that takes you through a whole rainbow of possibilities? Red, Orange, Yellow, Green, Blue, Indigo and Violet… colours are all around us! Join Nic Howard as she uses instructional videos, handouts and audios to guide you through a variety of techniques to create stunning scrapbook pages. 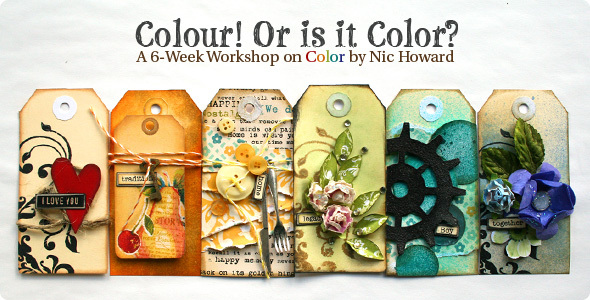 If you want to be part of a workshop full of fun colour theory, techniques and step-by-step assignments to extend the way you include colour in your projects, then Nic is here to help you achieve your creative scrapbooking goals! Sound like fun?! So here is the deal, this class starts on Thursday, June 30th. Yes that would be this Thursday. So to enter, leave a comment why you would want to take this class. You have until midnight PST tonight! Good luck!! I love to attend this class. I LOVE color...Would love to be able to use more colors & I think this class would help me rawk more projects. What an awesome giveaway! I have never taken a class on that site and would loooove to win one! I'm getting excited thinking about the fact that this class is to learn how to use the rainbow colors! And the tags of colors on the pic look so gorgeous...can I create that beautifully too? *smile* Thanks for the chance! I think this class sounds like tons of fun! I love color!!! I could use a little color in my life. Would love to escape with this class. I am slowly starting art journaling (was more into card making/scrapbooking) and this class would be perfect for my new found passion. Thank you for this opportunity ! I'm just reaching the end of Claudine Helmuth's Composition for Collage class at Big Pictures Classes. While I haven't found as much time to concentrate on the subject matter, I've discovered that the on-line class concept is outstandingly easy to follow and enjoy! Would love to take this class for several reasons, but the #1 reason is to get me out of my creative rut and to jump start my mojo, which appears to be among the missing these days. Thanks for the opportunity! I would love to take this class to better understand colors and how they work together. My graphic artist husband has a natural gift for using and blending colors on projects, but i just dont trust my own eye. Sounds like a very useful class! I'm always intrigued when companies and designers use colour combinations I'd never have thought of. I'd love to learn how to do that! I tend to use the same thing colorwise over and over. I'd love this class to help stretch my boundaries! What a wonderful opportunity! As a "newbie" on the papercraft (scrapbooking, stamping, etc.) world, I have found that these "arts" are not only fun to do, but also a way of healing and inspiring a hurt soul. Most of the time --specially when feeling blue, black and white are my preferred colors. Maybe, who knows?, If I get the opportunity to explore new colors, I could change this, and not only apply them in my crafts but also in everything I do!. I would love to win this class because I have been in a scrapbooking rut lately and need something to inspire me! What an exciting chance to win a spot in the class. Thank you for the awesome giveaway. I'm from South-East Asia and have been residing in the US for a year and the half. I got to know more about paper crafting since I got to the US and being new at all these, I would love to have the opportunity to learn more so that I can also share my knowledge when I head back home. I'd love to take this class! Thanks for the chance! Would love to take this class. I'm crossing my fingers that I get picked!!!! I would so love to take this class. I love color and am just starting to experiment with new combinations that I wouldn't have considered before. I NEED color. I think I really, really need this class. I am afraid to use real bold colors and I think that if I do use colors, it doesn't look right. I read many blogs and admire those that just have the talent to make such beautiful cards. I would love to be like them. So HELP! I would love to get more comfortable using more color and what colors complement each other. It seems like I always gravitate to the same colors. Thanks for a chance to win! I love color in my everyday life BUT I can't seem to translate that into my scrapbooking. Yes yes & yes. I would love to win this class because I find myself stuck. I was never a very good Arts student and my teacher once told me that I will fail if I took her class. I listened to her and now I regret it. Winning this class would allow me get into my creative side and I'll be able to show her what I've come too! I would love to take this class ! I am afraid to use color - what goes together, what doesn't ?? I am reliant on kit clubs right now for scrapping. Would love more confidence to break out and put some combos together myself! this looks awesome and so much fun! Love the concept of this online class, and would love to win :) I need some new inspiration right now, and this would be the perfect opportunity! I would like this class because I love colour. Note the way I spelled COLOUR. This class HAS to be just for me!